Learning to ride a bicycle is a key moment in a child’s life and an excellent way for families to spend time together. 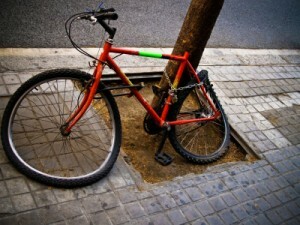 Unfortunately, accidents are far too common when bicyclists and other vehicles mix. According to the National Highway Traffic Safety Administration (NHTSA), 677 bike riders were killed in motor vehicle collisions in 2011, 59 of which were children ages 14 and younger. While no amount of training or preparation can prevent all bicycle accidents from happening, there are a number of safety measures that can help reduce the risk of child bike accidents. Always make sure that you and your child wear safety gear, including a properly fitted helmet, and elbow and knee pads. Avoid roadways that have high levels of traffic, limited bike lanes, or inadequate lighting. Children in bike carriers should wear helmets, too. Bicyclists must always ride with traffic and obey all traffic signs and laws. Make sure your children understand these rules, as well. Always ride with reflective gear or bright clothing to help make you and your child more visible on the road. Teach your children to cross intersections by walking their bike after looking both ways. Avoid riding at dusk or at night, when most bicyclist accidents occur. It is unacceptable for an innocent victim to suffer due to the negligence or recklessness of another driver. If you or your child has suffered injury in a bicycle crash, please call Santa Monica personal injury attorney Joseph H. Low IV to help you take the necessary steps to secure the financial compensation you deserve.